There is no way I can say this and it not be an understatement but there is clearly a lot of expectation surrounding this film. It is the continuation of a series that is legendary, almost in the old sense of the word as well as the new. It also takes most of its audience back to a world that, in some respects, they grew up in and for many it presents a new hope following the disappointing prequel trilogy. The Force Awakens itself is the start of a new sequence of three movies and there are already two other films in the works telling different stories in the same marvellous (Marvelesque?) universe. On top of that it is being directed by J.J Abrams who has the right kind of old school sensibility for this and did a pretty good job relaunching the Starship Enterprise. Hopes are high, quite probably higher than they have ever been for any other motion picture. Even though I have literally been counting down the days to this film’s release I was determined to try and ignore all of this. It is just too much for anything to live up to. I went in fully intending to judge it just on its own merits; not some frenzied fan idea of what those merits ought to be. Essentially I was trying to guard against disappointment. I needn’t have worried. The Force Awakens is great and I felt the same joy watching it as I felt watching Return of the Jedi when I was ten. It is exactly the sequel this old Star Wars kid wanted. In fact I was wrong to ever try and separate fan expectations from this film because they have gone a long way toward crafting it. For some years now I have struggled to put my finger on quite why the prequel trilogy failed but now I can see it clearly. With those movies George Lucas was focussed on telling his own complex story with no thought to what his audience might want. That’s allowed, it was his story after all, but this one feels a lot more like it has been made for those people that loved Star Wars as children. This is partly of course because J.J Abrams was one of them. The reason so many of us hold a particular place in our hearts for Star Wars is because Lucas created a world and we played in it, in our bedrooms with the toys, in the park and latterly on computers. Now it’s creator has stepped away from his universe and others have been free to have fun in it just like we did. The Force Awakens manages to feel like its own thing while still being a good homage to those original films, it is both contemporary and old fashioned in all the best ways. There is much to make you feel as though you are in familiar territory while it also provides new spins on old ideas. Of course a lot of the connection to what came before is reinforced by the return of some of the old cast and the way it uses these actors and their characters is another thing it gets just right. They are a significant part of the plot but it is not their narrative. The new cast are all very good. With Episodes I – III Lucas managed to somehow take good actors and prompt them to give laboured and wooden performances but time round the newcomers are all strong. It doesn’t feel as much like old characters passing the baton to new as it does a story about new heroes who are drawn into the saga. New heroes in the sense that they are new to us and in that they are new to being heroes. This is much as I can say without discussing plot points and spoilers but Star Wars Episode VII: The Force Awakens is a triumphant return to form for the series. It isn’t as brooding as The Empire Strikes Back instead going for the fun and adventure of the first film but with better character development, particular with Adam Driver’s Kylo Ren who might just take the movie despite strong competition from Harrison Ford comfortably bring Han back. It is a joy to see the Millennium Falcon in flight again and there are lots of other things that, as I say, I can’t mention. Disney appear to have kept their finger prints off it and it has given us everything we wanted and lots we didn’t know we wanted. Go expecting an enjoyable, often funny, film with an intriguing story, great characters and cool lightsabers being waved around and you won’t be disappointed. If you are watching it through nostalgia tinted spectacles (3D or otherwise) then I think you’ll love it. 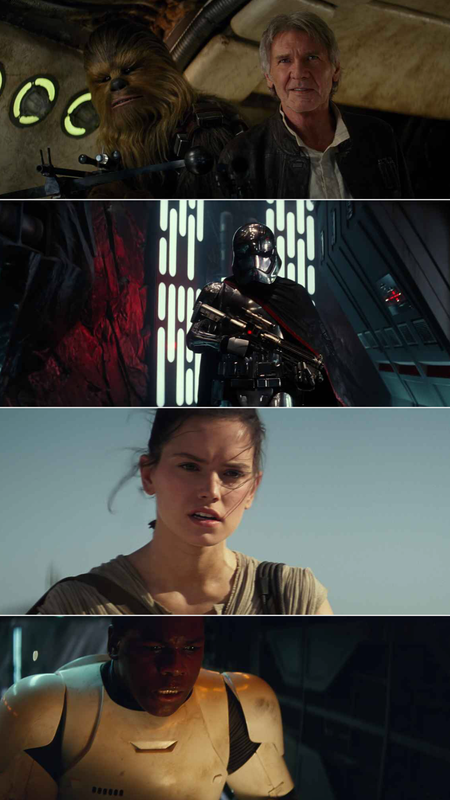 Daisy Ridley’s Rey is actually the main character, or at least it is evident that she will be once this new trilogy is complete. She is certainly brave and capable and she moves the story forward. There is actually a nice moment where John Boyega’s Finn underestimates her slightly because she is a woman, thinking is his duty to take the lead in the action, and she puts him right. She is not at all objectified either which might seem obvious for a Star Wars film but Attack of the Clones did contrive to expose Natalie Portman’s midriff and don’t forget how they dressed Princess Leia in Jabba’s palace. If your children have seen the other Star Wars films they will be fine with this one. Like Revenge of the Sith it is rated 12A but there is nothing as grizzly as the toasting and dismemberment of Anakin Skywalker that happened at the end of that one. Clearly a few Stormtroopers get shot and there is a small amount of blood (cleverly used at one point) but it is no worse than all of those superhero movies. There are a couple of larger space beasties that may disturb more sensitive smaller children but again nothing worse than we’ve seen in this universe before. Just take them. I saw Star Wars when I was five and the only effect it had on me was starting off a lifelong passion for cinema. I can read the smile (of relief?) on your face as you wrote this. Hope you enjoy the 3D version as much! Have a great Christmas! Relief played a big part. The 3D was largely pointless (again). You have a good Christmas too.